Outstanding!! We loved everything about our stay. The villa is gorgeous. The original features are well maintained and the updated amenities blend in perfectly. With 3 couples it was great for each to have their own washroom. The bbq area is so pretty, we opted to stay in and cook for ourselves a few nights. The local grocery store is well stocked, and the village of San Casciano is welcoming. We were happy to be there on market day! In the area we enjoyed olive and wine tastings, and were lucky to be at Podere La Villa for the harvesting of the grapes. Ilaria and her family are friendly and warm; she was willing to help us with any outings. 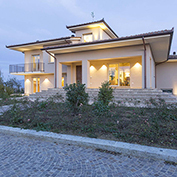 The location of the villa is excellent - only 20 minutes from Florence. We also did day trips to Pisa, Luca, Siena, and San Gigmano. Just a fabulous place to stay - loved everything about it!